ResMed offers a full range of CPAP masks and provides the most effective sleep therapy possible to users. ResMed CPAP masks are comfortable, lightweight and engineered to feel as if they are barely there. 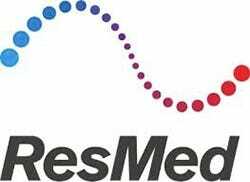 For over 25 years ResMed has been a leading pioneer of innovative treatments for sleep-disordered breathing. Browse our selection of CPAP machines to find a CPAP mask that works for you. ResMed offers a range of mask styles; all are engineered to meet a high standard of quality and comfort. Cheap CPAP Supplies is here to offer you the lowest possible prices on ResMed machines. Our team of CPAP experts is here to help you find a mask that fits perfectly, meets all your needs and ensures satisfaction. ResMed supplies CPAP, APAP, and BiPAP machines, and is one of the most trusted manufacturers in the industry. Their wide selection allows the user to choose exactly what they desire when it comes to a mask. ResMed CPAP machines also employ the latest technology while maintaining their usability, making them a great choice for beginner CPAP users. The Nasal Pillow mask is a great choice for those desiring an open view, with the mask fitting comfortably over the nasal passage. The unobtrusive design allows for the user to wear glasses without interference. The Swift FX mask has an option designed especially for women, combining lightweight structure with a feminine design. The ResMed Air Solutions masks are extremely lightweight, and feature a clear field of vision for the user. Simplistic design allows users to read or watch TV while wearing the mask, ridding the hassle of an obstructed view. For those who breathe through the mouth while sleeping, ResMed offers full face masks that still retain the lightweight design of masks like the Swift FX. The Quattro mask provides the stability of a traditional full fask mask while still providing a clear field of vision. The AirSense CPAP aims to help you adjust to sleep apnea therapy with no complicated settings to navigate. The machine engages technical features like an ambient light sensor and a smart start function that begins CPAP therapy as soon as you breathe into the mask. For maximum comfort, ResMed offers the Mirage FX Nasal Mask mask with a unique DoubleGel cushion that conforms to the nose and facial features for a soft, comfortable fit. The Mirage also has small built in vents that diffuse air quietly, which makes this mask ideal for those who share a bed. Remember our 30-Day Mask Guarantee when choosing your mask-call one of our experts today to discuss options at 1-888-909-5506. Don’t forget to check out our cleaning supplies and mask accessories to stay on top of caring for your mask. Maintaining a clean CPAP mask will ensure the machine works properly, which allows you to sleep peacefully. Cheap CPAP Supplies offers a wide variety of cleaning products including wipes, sprays and tube brushes. We provide much more than CPAP machines: browse our inventory of humidifiers, travel cases, hoses, battery packs, mask cushions, and more.